I bought this Hellebore for myself last week the bud was tightly closed . It seems to be a nice double white . Unfortunately this is what it should have been. Petrol to return it would cost me five pounds.So it looks like I'll just keep it .and maybe buy another one next time we are over that way. Spring is marching on the bulbs in the plant house are starting to flower .The tomatoes have been sown along with Salad and Vegetables. I went to garden centre yesterday and saw Primrose Vulgaris priced at #3.99 for a small pot . I came home and pricked out a further 22 tiny seedlings . The Hellebores are coming into flower beautifully I treated myself to a double one at the garden centre yesterday will post it when it opens its buds. 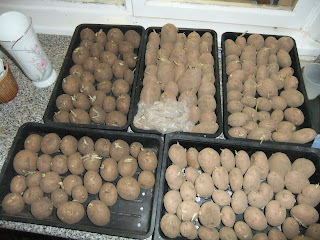 The seed potatoes have arrived and are already chitting .There are two varieties Rocket and Sarpo Mira . 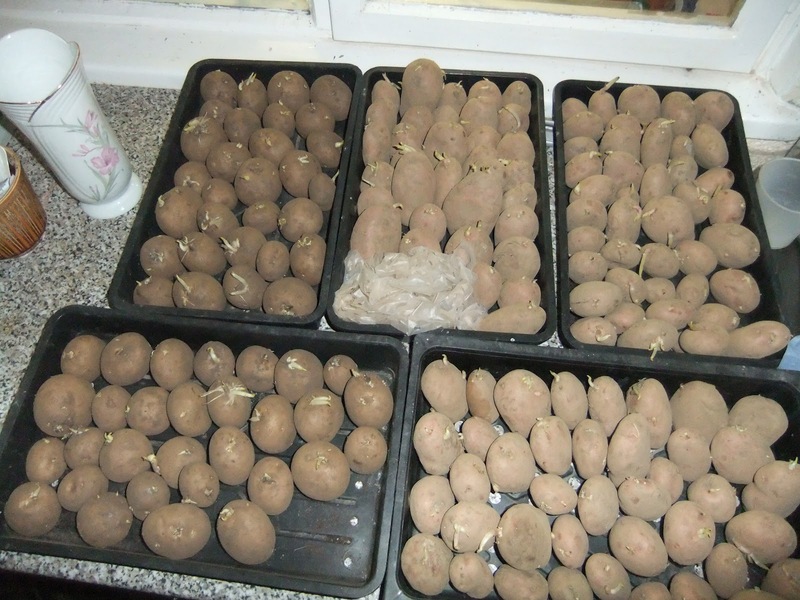 The earlies are Rocket, these are soon to be planted in the greenhouse to ensure we have nice early potatoes.The main crop are Sarpo Mira these are a super potato and my all time favourite .They have a wonderful flavour and they are an all round cooking potato .They steam, mash ,bake and roast really well, but their main attribute is that they are blight resistant so no spraying is needed at all . I can't recommend these high enough as an easy potato to grow that crops well . 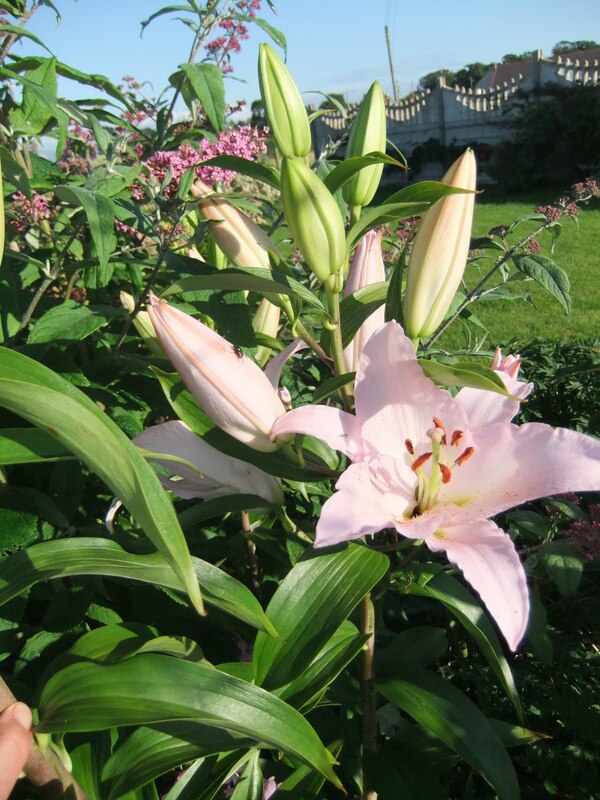 These little seedlings of Lilium Martagon have finally appeared after being sown 12 months ago. Only 3 have come through so far out of about 10 seeds a lot of TLC needed yet . Assorted Cauliflowers have germinated and are about to be pricked out into individual pots so they will be ready to plant out in the garden as soon as the weather warms up a bit. I accidentally spilt some salad herbs on the potting bench last autumn just before I planted my spring bulbs . My Hyacinths are coming on well in this trough but I also have a free crop of salad herbs to pick . Well what a strange start to the year .The flowers in bloom in the garden reflect the odd start to the year, Currently I have pink flowered Strawberries, Sage. Snowdrops and Hellebores. The strong winds and gales Snapped my Cordyline in half , but hopefully it will recover from halfway up the trunk. We have a new rat proof hen pen but still having endless battle with the nasty critters. No sooner do I seem to be getting on top of them ,but new ones move in. I have lots of plans for the garden this year , back to basic vegetables with tried and true favorites. 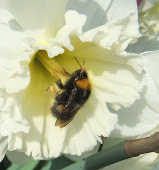 Lots of bulbs planted in Planthouse for early flowering to cheer me up on dark rainy dull days. I hope to have lots of interesting photos and items to share .I hope you will return form time to time to see how I am progressing ,you will be most welcome.